Jeep check engine codes for the Jeep Wrangler YJ and the XJ Cherokee. These codes and video may work with other OBD1 Jeeps. When Chrysler / Jeep came up with this idea for getting the engine codes, it was a very smart move. This generation of Wranglers and Cherokees had the most simple diagnostics of any other. You need no special scanner to get the trouble code. Just a series of light flashes and the little light becomes a trouble shooting narc!! Below is the list of all the various Jeep check engine codes that the on-board computer can generate. At the bottom of the page is a YouTube video of how to get the trouble codes from Jeep PCM. Want a clean printable copy of the Engine codes ... Click here. Turn the key to ON, OFF, ON, OFF, ON ... stop .. leave the key in the ON position (Complete this sequence in under 5 seconds). Once you stop the key in the ON position, the check engine light will stay lit for a moment. When the light goes off, get ready to start counting the light flashings. would be FLASH ... <PAUSE>... FLASH FLASH followed by a <LONG PAUSE>, followed by the next code. Code 55 signals the end of stored OBD codes. You can repeat the key sequence as many times as needed if you were unsure of a code. *= Check Engine light will not illuminate at all times if this Trouble Code it present. 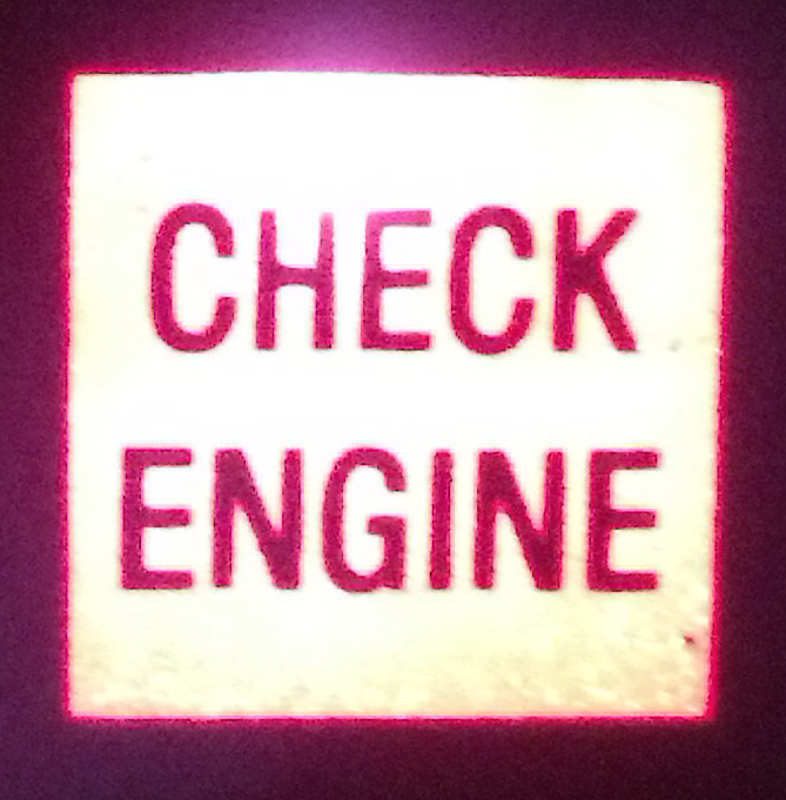 **= Check Engine light will illuminate during engine operation if this Trouble Code is present. 12*: Battery or computer recently disconnected within the last 50 start cycles). This is a very common code. Will not trigger a "Check engine light". 13**: No change in Manifold Absolute Pressure sensor (MAP) from start to run. 14**: MAP sensor voltage too high or too low. 15**: No speed sensor signal detected. 17*: Engine stays cold too long. Bad thermostat or temp sensor. 21**: Oxygen sensor input voltage stayed above normal operating range. 22**: Coolant temperature sensor signal above or below acceptable voltage. 23**: Intake air temperature sensor signal above or below acceptable voltage. 24**: Throttle position sensor signal above or below acceptable voltage. 25**: Automatic Idle Speed (AIS) motor driver circuit shorted. 27*: One of the Injectors output drivers does not respond properly to control signal. 33*: Air conditioning clutch relay circuit open or shorted. If your Jeep doesn't have AC you will always get this code. Will not trigger a "Check engine light". 34*: Speed control vacuum or vent solenoid circuits open or shorted. Switch is above or below acceptable voltage. 35*: (XJs only) Cooling fan relay circuit open or shorted. 37: Relationship between engine speed and vehicle speed indicates no torque converter clutch engagement. An open or shorted condition detected in the torque converter part throttle unlock solenoid control circuit. Incorrect input state detected for the Park/Neutral switch. Auto only. 41**: Alternator field control circuit open or shorted. 42*: An open or shorted condition detected in the auto shutdown relay circuit. An open condition detected in the ASD relay output circuit. An open or shorted condition detected in the fuel pump relay control circuit. An open circuit between PCM and fuel gauge sending unit. Circuit shorted to voltage between PCM and fuel gauge sending unit. No movement of fuel level sender detected. 43: Peak primary circuit current not achieved with maximum dwell time. Misfire detected in one or more cylinders 1 thru 6. (4 and 6 cyls). 44*: Open or shorted condition in the engine coolant temp sensor circuit or a problem exists in the PCMs battery temp voltage circuit. 46**: Battery voltage too high during charging. 47**: Battery voltage sense input below target charging during engine operation. Also, no significant change detected in battery voltage during active test of generator output circuit. 51**: A rich air/fuel mixture has been indicated by an abnormally rich correction factor. 52**: A rich air/fuel mixture has been indicated by an abnormally rich correction factor. 53*: PCM module internal problem. 55*: PCM has finished telling you the codes. This means you are done reading codes. 62: EMR mileage cannot be stored in EEPROM. 62: PCM failure SPI mile not stored. 63*: Controller cannot write to EEPROM. 64: Catalytic converter efficiency failure. 65: Power steering switch failure. ****This information was gotten from the Chrysler FSM, Quadratec & various posts on WranglerBoard forum. So, I can’t and will not promise or guarantee it’s complete accuracy. Diagnosing trouble codes and changing parts can still be like chasing a needle in a haystack. But, it’s always a good place to start. Click here for a clean printable copy of the Jeep Check Engine Codes.